Welcome To The Miller Insurance Agency! Most people agree on whats important to them when choosing an insurance company. For most, name recognition is important and so is the ability to get a variety of policies from a single source. For many, their choice is the result of a referral from a friend or business associate and price is almost always a consideration. 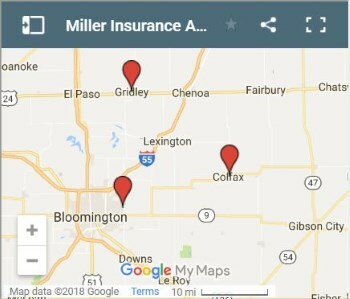 At Miller Insurance Agency we believe you should understand all your options in order to choose policies that provide the coverage you need at rates you can afford because it makes no sense to pay for coverage you don't need and the best insurance in the world does you no good if the premiums aren't affordable. As an independent insurance agency we can provide insurance from a variety of underwriters so we can offer you the best coverage at the best price. Obviously no one ever wants to have to file an insurance claim but you can rest assured that if and when you do, we will be available to help expedite the filing process so you can get on with your life.